Dot, a 5 week old female seal pup, was rescued on 22nd December 2010 from Tintagel by members of the British Divers Marine Life Rescue (BDMLR) team. The pup was found to be underweight and had trauma to her eye. Dot weighed 12 kilos upon arrival at the hospital and was prescribed noroclav, bisolvon, carprodyl, multi-vitamins and iron tablets. Update: 28th December 2010 - Dot is now in the main hospital and learning to feed. When she is confident at catching fish we will introduce her to other seals. Dot´s flipper tag number is 26(white). 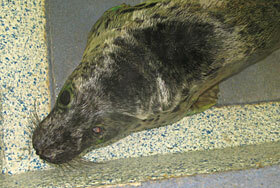 Update: 8th February 2011 - Dot currently weighs 16 kilos and is in nursery pool 2 with Flo and Nigel. Update: 4th March 2011 - Dot is in nursery pool 1 with Gypsy and are doing well and putting on weight. Dot has a trendy new hair do and has two stripes on the top of her head. Update: 30th May 2011 - Dot along with Flo, Gypsy and Coral were released back into the wild at Porthtowan on 17th May 2011.